Send Notification to Site Admin: Regular Toggle switch that turns on email notification to default site admin every time user registers. Define Recipients Manually: Allows notifications to be sent to the other recipient than site admin, or where multiple persons need to be notified of form submissions. By default, it contains only admin’s email address. You can add more email addresses by clicking on “Click to add more”. From Email Name: This is the name which appears inside email header as sender’s identifier. From Email Address: The Reply-to email address inside the emails delivering notifications to the admin and the members. It is a good idea to use an email address different from the admin’s email address to avoid being trapped by spam filters. 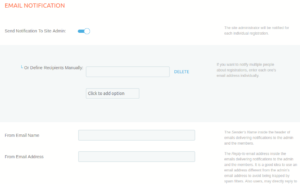 Also users may directly reply to notifications emails – therefore you can either user an actively monitored email or specifically mention in your email templates that any replies to automated emails will be ignored. Username and Password, if authentication is required.